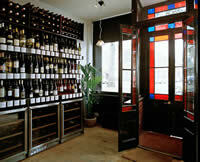 Independent wine shop in Victoria Park Village offering wine tastings, Enomatic wine tasting system and fantastic selection of wines, spirits and ports in the heart of East London’s leafy Victoria Park village. Slap bang in the heart of Victoria Park Village. Bottle Apostle is THE new shop on the block, offering a ‘hard to resist’ selection of 32 different wines available to experience daily. Inside the shop are special Tasting Engines that allow you to sample some of the many wines on offer. The staff will give you your free Bottle Apostle Smartcard then YOU top it up with credit and start tasting. The Tasting Engines are self-service, one is chilled and the other stays at room temperature. Simply insert your credit, select the wine you fancy sampling and the Tasting Engines will do the rest. It is that simple. The shop stocks an international assortment of wines and updates its portfolio with around 40 new varieties every month, some of which are exclusive to Bottle Apostle. Bottle Apostle also stock hard to find spirits, specialist beers and a range of glassware and accessories. 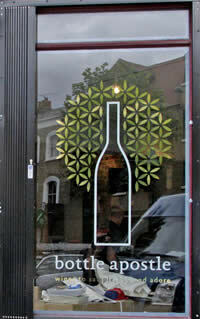 The shop also hosts popular tasting events on the premises every few weeks. All classes guarantee a wide range of styles and price levels for you to try. Plus every session is devised to tackle a different topic than the last, allowing you to really focus on particular areas of interest. If you can’t make an event, then why not pop by the shop with a bunch of friends before a night out, this a great way to start an evening. By arrangement the shop can also cater for larger crowds wanting to have a private tasting session or for a party who wish to do something different to mark an occasion. Whether you are an expert or just someone who likes a good wine, Bottle Apostle always offers great wines to sample, buy and adore! Tuesday – Friday 12.00 to 21.00; Saturday 10.00 to 20.00; Sunday 10.00 to 18.00. Free parking is available outside the shop!